A view of Adventure Aquarium in Camden, as seen from Philadelphia's Penn's Landing. Something has been missing from Camden’s waterfront skyline. The dome lights at the Adventure Aquarium, which changed colors with the weather and turned festive for special occasions, have not been turned on for years. So what is going on with the lights at this popular tourist attraction? A reader posed that question on Curious Philly, a forum through which Inquirer reporters find answers to issues of interest in the region. The lights are broken, said Patricia Mole, the aquarium’s communications coordinator. The unique fabric dome was part of the aquarium’s architectural design when the state approved the $52 million project. It opened in 1992. 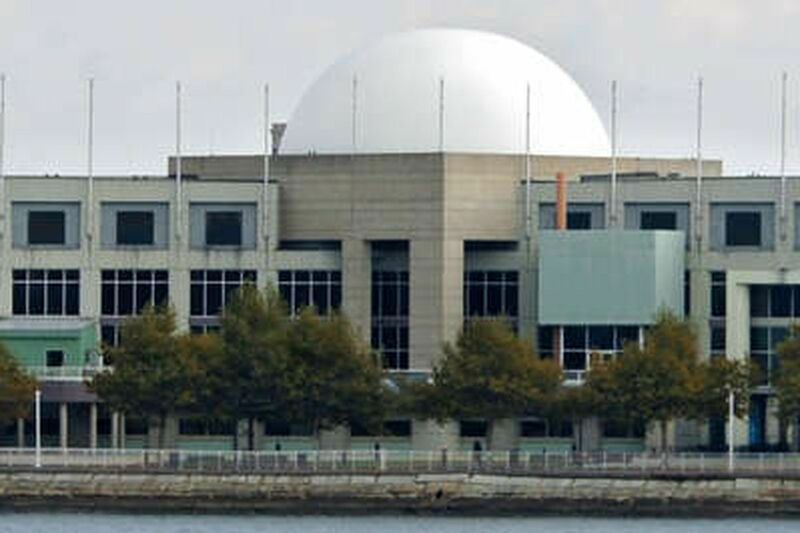 The dome was designed with computer-controlled, color-coded lighting that reflected the forecast of the National Weather Service for the next day. Blue was a sign of clear skies to come, white predicted cloudy conditions, red warned of an incoming storm, and blinking red cautioned that severe weather was on the way. These days, the dome remains white as if a perpetual cloud hangs over New Jersey. Rare African penguins enjoy an outdoor pen at the Adventure Aquarium in Camden. The privately owned aquarium, operated by Herschend Family Entertainment Corp., has had numerous expensive and elaborate additions and upgrades since its debut. There’s the underwater tunnel and tank where divers swim with sharks, and hippos can be seen on land and underwater. There’s also Penguin Island — upgraded last year — that hosts a large colony of the birds that can be seen frolicking and swimming.